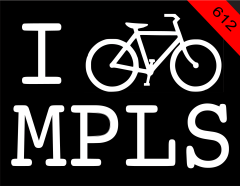 IBIKEMPLS.com - it's where I get all my news: God bless our freedom! May Day, gorgeous Sunday, Bloomingon avenue, Powderhorn park, thousands of people, lots of bicycles, live music, the company of good friends and neighbors, stiltwalkers, fresh lemonade, deep fried cheese curds, keg of Fat Tire at Mark's house, birthday cake for Sylvia Fleck, followed up by citations for loitering and drinking in public (yes we were standing on the sidewalk in front of a friends house drinking beer - aghast, I know - somehow this individual wasn't awarded a ticket.) Photos in the next posting as soon as I wittle through them.